I keep the base outdoors so it needed a good wash! No prizes to be won for guessing whats inside. With temperatures going sub zero and space needed in the garage it had to go into a carcoon. Hopefully the garage will be empty again soon & some sunny days on the way.. 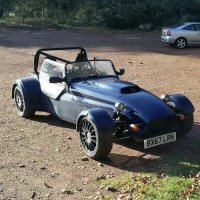 I don`t really see the point of Atom Nomad in the UK, unless you live in rural Scotland etc where maybe you can start exploring its potential. Haven`t driven one but wouldn`t be at the top of my list. For anyone interested: Since announcing the sad closure of Rockingham our track days have seen an incredible rise in popularity as people try and get out on circuit for one last time. With this in mind we have decided to open up an additional open pit lane session on Sunday 25th November. This date has not be advertised anywhere else and can only be booked by contacting Cassie Clarke directly. Places are limited and will opporate on a first come first serve bases so to be in with a chance please get in touch as soon as possible. The day is being run as unsilenced and costs £135. To book your place please contact Cassie on 01536 271542 or via email Cassie.Clarke@rockingham.co.uk Hope to see you there! All the best. What after a 7? An 8 of course! @Dave (OnliestSmeg) - Manchester AO That`s useful - I have a suitable piece of steel, just need to find a way to cut it neatly. 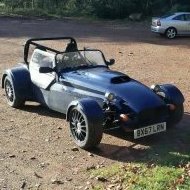 @Skypeller Thanks; I paid £369 for the half hood with drivers side zip and screen channel, lightweight bag, delivery and fittings (no bar). Outdoor carcoon. Works just fine. Fitted mine yesterday & had a dry test drive today so I`ll add my 2p: + nice and warm inside the cabin, so less weather gear needed (some 5-8 degrees today) + my doors without the holding straps (not fitted yet) stay in place in the corners! + I felt a bit more anonymous (if you don`t like all the attention) + perfectly fine with MSA bar up to 60mph, buffeting probably okay for short-mid distances at 70mph + no need for glasses / sunglasses +- feels much more like a regular car with the hood on - I can see why leaving the hood off as much as possible is still the preferred choice - I`m pretty worried about the longevity of screen channel. Quite impressed with Soft Bits quality. Thanks for all the replies. I`m not too fussed about having a bit of oil to clean up as long as it`s mechanically all ok. I fitted an oil catch can to my tin top turbo engine, not sure I really need one for Westy. Maybe as a future upgrade. Before that - still a few upgrades on the way. I noticed I`m getting a bit of oil coming from the crankcase filter (car was driven hard lately); dipstick shows oil at right at maximum level. Is it okay to leave it like this or what`s the best course of action? I guess 1:38 and and 1:58 is the boost part of Ecoboost. Really enjoyed the day & it was nice to meet you guys. @Scotty72 will you be uploading anything from your gopro? A few pics from today below. I`ll be looking into additional an mounting point at the front after Donington. I keep a spare rubber mount in the car just in case - are there any heavy duty versions that you know of?